Travel light because almost everything you could need will be on board, forget about time – or rather – allow yourself a decent amount of time to fully enjoy the sea, to sail from cove to cove without any rush, to be captivated by a magnificent sunrise, to relish the first swim of the day before enjoying a lazy breakfast, to feel the sea breeze and salt on your skin... just some of the infinite sensations Island Yachts Broker & Charter proposes for your next holiday. The main ingredients needed to make this sailing holiday plan a reality starts with the boat. Chartering is an ideal formula, it is important to choose the right boat for the true experience; it must be comfortable, safe... and have everything to make your voyage unforgettable. Contact to Island Yachts Broker & Charter, a company based in Menorca, with extensive experience in the sector that offers a select range of boats, distinguished by its unique personality, excellent design and comfortable style. We specialize in llauts Menorquin Yachts, sport yachts (Cranchi, Princess, Mangusta, ...), ribs (Sacs, Zodiac, ...), ... Island Yachts Broker & Charter offers a diverse range of boats for hire in Menorca, with models ranging from 8 to 20 meters in length, each with different capacities, both in the maximum number of people who can navigate, as in the berths. Spaces equipped with all the amenities to make life completely on board. Cabins with bathrooms, kitchens equipped with full facilities for making exquisite menus, large solarium, ... etc. 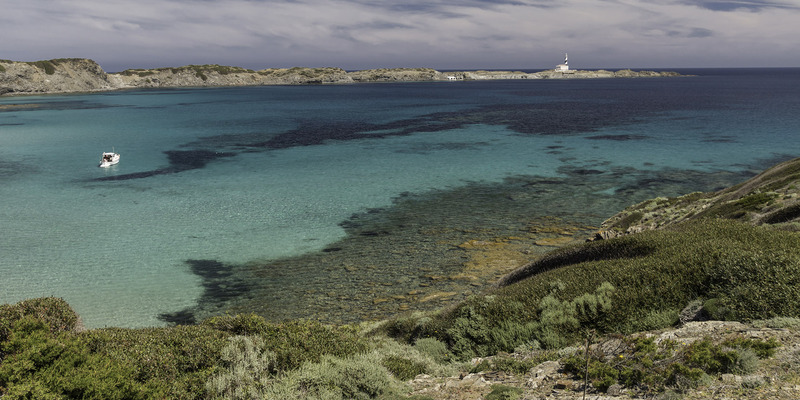 The island of Menorca boast a fascinating coastiline, full of wonderful spots to discover. The cruise you choose will depend greatly on the days you have planned to spend the summer on the island. Island Yachts Broker & Charter recommend you to make a “round island trip”, following a deeply rooted tradition of the Menorcan residents. Menorca, sailing from cove to cove. You depart from the Port of Mahón and begin your journey on the sea to discover the extraordinary captivating and contrasting scenery of the island of Menorca, designated as a biosphere reserve by UNESCO in 1993. On the South, the white sandy beaches and the turquoise blue sea dazzles and transports you far, far away. Macarella, Macarrelleta and Turqueta are all coves which deserve a visit as well as others less well known but equally enchanting ones such as Escorxada or Es Talaier . To the North, your perception of the landscape is changed as it becomes more rugged and the sea an emerald green, with impressive cliffs and dark sandy beaches. We recommend you see the cove of Algaiarens and anchor off Cala Pregonda at dusk for a magical sunset. 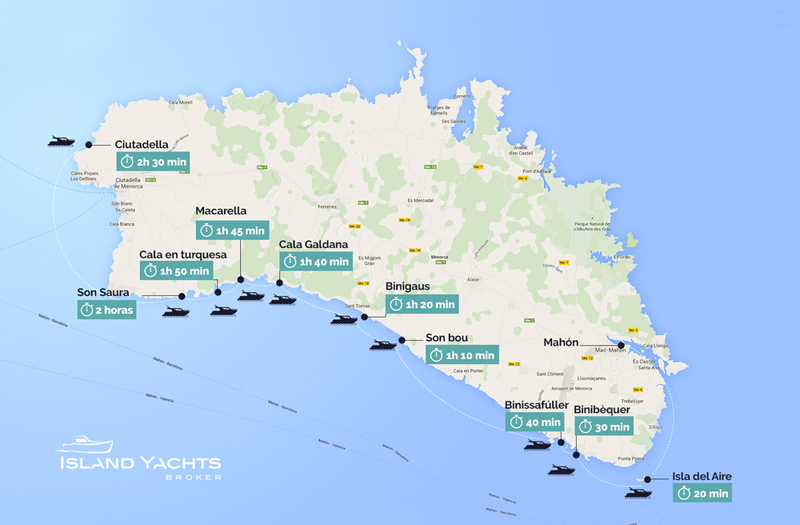 Returning to Mahón, the views from the sea of the Isla del Rey, Cales Fonts and the island of Lazareto complete this voyage. During the trip we will stop at highly recommended restaurants to sample the exquisite Mediterranean and traditional cuisine of Menorca: Es Grau, Fornells, Port Ciutadella, Macarella, Cala Galdana, Santo Tomas, Binibeca, Cales Fonts, and the Port of Mahon. Here we provide many attractions and the corresponding distances. Cala Pudent: 1 hour and 20 minutes. Fornells: 1 hour and a half. Tirant cove: 1 and 45 minutes. Pregonda: 2 hours and 5 minutes. La Vall: 2 hours and 15 minutes. Isla del Aire: 20 minutes. Son Bou: 1 hour and 10 minutes. Binigaus: 1 hour and 20 minutes. Cala Galdana: 1 hour and 40 minutes. Cala en Turqueta: 1 and 50 minutes. 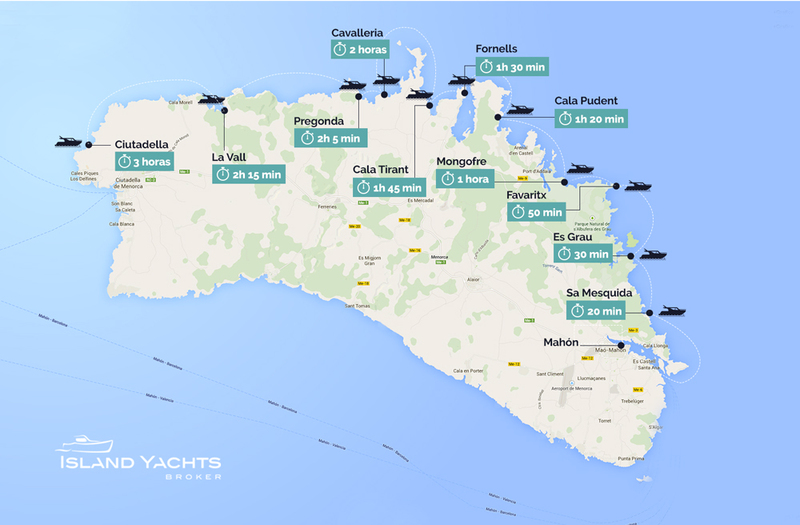 Island Yachts Broker & Charter develop fully personalized itineraries tailored to the client. You only have to indicate the number of days to navigate, if you have any special preference as to the itinerary and ultimately choose the boat that best suits your needs and / or interests. The rest we will us. Take a guided tour of the Albufera d’es Grau Natural Park, a paradise for migratory birds, fish and reptiles; enjoy a delicious lobster “caldereta” in Fornells; visit a farm; visit the old historical town of Ciutadella; do shopping in the center of Mahon; visit Favaritx, Cavalleria and Monte Toro; sample a typical Menorcan dinner in one of the charming restaurants in Cales Fonts; these are just a few of the possible activities to enjoy on land whilst discovering the island of Menorca. If the trip coincides with the dates of one of the popular festivities they are also worth experiencing, hundred-year-old traditions which are celebrated throughout the summer in each of the islands towns. The horses are the main protagonists of these festivals; they are ridden through the streets by the riders or caixers dressed in traditional black and white costumes whilst demonstrating their competence to the public. For those fond of hiking, it is possible to alternate sailing with some walking along the “Camí de Cavalls”, an historical route which dates from the XIV century and borders the coastal perimeter of Menorca, originally part of the island’s ancient cavalry defences. What are you waiting to book your next holiday in Menorca ?! Menorca, the island of calm, the wind, the desired.